View Services and Book Online! Unlike more invasive therapies and treatments, you will walk out of your cryotherapy treatment minutes after it starts. It’s quick, painless, and addresses a wide array of issues. Born from extensive research and the needs of our community, CryoMedSpa wants to change how Durango thinks about health and wellness. Sherri Phippen and Colleen Peterson are excited to bring this State of the Art, Juko and T-Elephant equipment to the area. Using two pieces of equipment you can be treated in the Whole Body Cryo unit or try a Localized treatment (specific spot areas) or a Facial, tightening pores, treating fine lines, wrinkles, improving the over all appearance of your skin. Using sub-zero temperatures cryotherapy will create conditions for tissue regeneration and repair. This could be the best three minutes of your life! We live in a great community full of active people who want to stay healthy...forever! With its trails and mountains, rivers and rapids, slopes and climbs, there’s no shortage of ways to beat ourselves up while enjoying the bounties of this region. Cryotherapy* triggers the body to release a flood of beneficial biochemicals and endorphins into the bloodstream. We have options for everyone from 13 to 100 years of age! *Cryotherapy is not to be confused with cryonics… as much as we’d like to freeze you into the future, our treatment lasts a manner of minutes--not centuries. By tapping into and activating your body’s natural response to cold exposure, cryotherapy propels you down a path of healing and revitalization by non-invasive means. Whole Body Cryotherapy exposes the outer surface of your skin to numbingly-cold Nitrogen gas vapor for a controlled period of time. Overseen by our certified expert cryotechnicians, the treatment is entirely safe. Localized Treatments and Facials are available to compliment Whole Body Cryotherapy. A controlled stream of cool air can be applied as a facial or to other specific problem areas and injury sites. FEATURING A NEW ADDED TREATMENT - YOU ARE GOING TO LOVE IT! CRYOSCULPT - reduce fat deposits and cellulite. Cryolipolysis reduces body fat without damaging other tissues. Call for more information! It sounds unbelievably cold, we know, but it’s also unbelievably invigorating. You will be amazed at how great the treatment feels and how rejuvenated you are afterward. 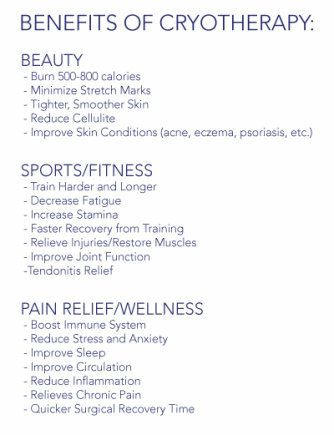 Reap the rewards and try to imagine how you ever lived without Cryotherapy!